Raychel has always been close to Matt. When times have been tough, it was Matt she turned to. At one time, she might have even wanted to date him. But to her surprise, it is Matt’s brother Andrew for whom she ends up falling. This is complicated, not just because Matt and her are so close, but also because of how much the boys' parents treat her like a member of the family. And with everything else going wrong around her (including conflict with her mother, financial woes, and a series of sexual assaults), Matt and Andrew’s family is an oasis for her – a rare place where she can find peace. But an unexpected tragedy mid-way through the story flips everything on its head and the furtive secrecy becomes suddenly irrelevant. Despite that rather busy-sounding synopsis, this is actually a pretty languid story. 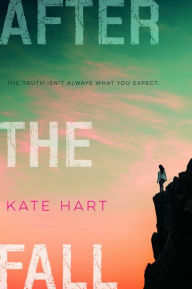 Its most striking feature is the way that Hart tells the story, using Raychel and Matt’s flawed points of view. Usually, the alternating narrator is a powerful dramatic tool when the best voice tells each part of the story. Hart takes the opposite approach, using the device to show how badly Raychel and Matt misunderstand each other. The effect is devastating and raises the already tragic events of their lives to a higher level of poignancy. Beyond that, the characters and the plot are a bit of a mixed bag. The grownups are notably relevant and vivid, offering both good and bad advice (and with the parents in particular having interesting dynamics with their children). The other kids are less developed (Raychel has some good supportive friends, but I could never get into them and they seemed thin and undeveloped). The story doesn’t add very much to the subject of interpersonal relations or consent, but has a comfortable authenticity to it that will resonate with readers.